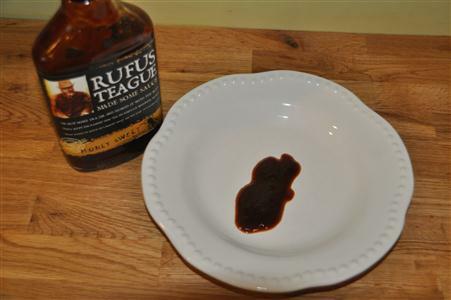 Before even tasting the sauces, Rufus has some excellent attributes – Gluten Free, HFCS Free, no strange ingredients, has a cool flask shaped bottle, and has a cool character and backstory in Rufus. I like the fact that they swear on the bottle. It’s a damn good idea. 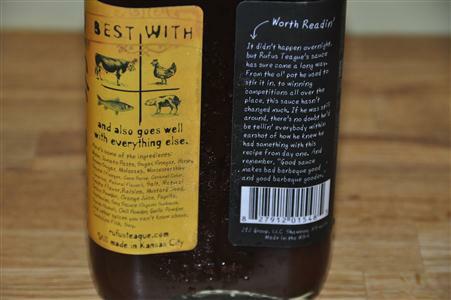 The label has a great design and copywriting with a sense of humor on the label. They market the all natural sauce in a subtle way so it’s not overly in-your-face to threaten die-hard BBQ’ers. Don’t want to piss off those guys! One thing I think of when they discuss honey is a few sauces I’ve tried that went way overboard with the honey flavor. The Honey Sweet name and a picture of a bumblebee – might lead some folks into thinking they’ll get a very strong natural honey flavor which isn’t the case. It’s got a combination of great ingredients and a molasses/soy/Worcestershire savory blast of flavor. Nice. It’s a smooth, dark, molasses-based sauce with the same base as Rufus Teague’s Touch of Heat (review coming soon) without as much tang making it a bit less complex – but still a very solid contender in the category. It’s still enough to be given my highest rating.